A while ago I posted an article about children understanding the different tones of bark that a dog might have (angry versus happy, etc.). Well, today I found another interesting article about dogs and children. 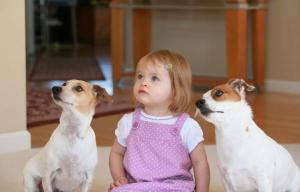 Dogs and children of about two years of age have a similar capacity for understanding social cues such as nodding, pointing, and speaking encouragingly. This was explored in a study by Eötvös University in Budapest, Hungary where children and dogs played a hiding game. Children and dogs were more likely to choose a direction if it was suggested by someone (by means of pointing). If you think about it, this says a lot more about dog's cognizance than it doesn't. A lot of things are required to understand a pointing gesture. One must understand that somebody else understands what your looking for, see that they are doing something odd with their arm and hand, realize that their gestures are meant to refer to the outside world, and extrapolate from there that they are giving direction. It is a much more complex logical process than it immediately appears. Another note on canine intelligence: dogs can classify complex photos into groups, in the same way that people do. This study, from the University of Vienna in Austria, also has some exciting implications about just how smart our four-legged friends may be. One last article, from the New York Times., also takes up the topic of canine intelligence. Enjoy the thunderstorms, and hope your power stays on. I do think that kiddos and doggies have figured out life much better than us adults. :-) Fun to read the articles.